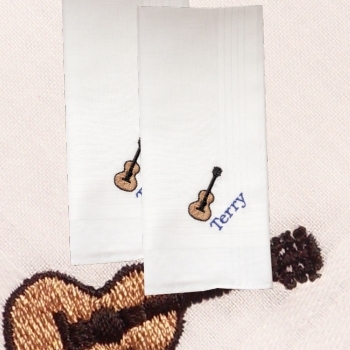 Embroidered guitar handkerchiefs. Acoustic guitar motif on a pair of white cotton hankies. Embroidered with a single name or initials in your choice of thread colour and letter font style. You get two classic cotton handkerchiefs in this set. Select from mens 38cm hankies or ladies 28cm hankies. A fantastic and unique gift dedicated to music lovers everywhere.